The Lord of the Rings The Card Game Fellowship 2015 Event at The Wandering Dragon! The Lord of the Rings: The Card Game Fellowship 2015 Event is coming to The Wandering Dragon on Friday, November 13th and Saturday, November 14th! *$25.00 if paid by Tuesday, August 25th. $35.00 if paid after Tuesday, August 25th. Taking place on November 13th and 14th, 2015 The Lord of the Rings: The Card Game Fellowship Event is a chance for players to come together and share their appreciation of the game even as they attempt to navigate the treacherous turns and trials of a special, all-new scenario. The centerpiece of November’s Fellowship Event is the new, standalone scenario, Murder at the Prancing Pony. This fifty-three card scenario, produced by FFG’s in-house manufacturing, comes complete with three quest cards and fifty encounter cards. During the event, players will play through the scenario in groups, and each player who participates will walk away with his or her own copy! 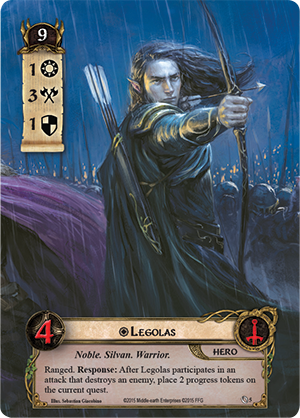 Additionally, each player who participates in November’s Fellowship Event will receive an alternate art version of the Core Set Legolas , as well as an exclusive playmat, which features a dramatic portrayal of Gimli and Legolas back-to-back atop the walls of Helm’s Deep. In Murder at the Prancing Pony, several of Middle-earth’s greatest heroes are called into action when Barliman Butterbur, the proprietor of The Prancing Pony, discovers a dead body lying slumped and bloody in the corner of his establishment. Scenario-specific rules direct the creation of an “Investigation deck,” and players will need to work together to investigate the crime and work through a list of possible suspects and hiding places. The result is a classically engaging murder mystery, given life in Middle-earth in card game form, and the 2015 The Lord of the Rings: The Card Game Fellowship Event is the first chance players around the world will have to gather, band together, and begin their investigations. However, you don’t win Murder at the Prancing Pony as soon as you identify the killer and his or her hideout. The scenario’s five Suspect enemies are all talented killers, each of whom has mastered a different fighting style. Accordingly, your play experience and the challenges you face will vary considerably with each different possible combination of Suspect and Hideout, making Murder at the Prancing Pony a scenario particularly well-suited for multiple sessions, such as those that you might enjoy during the 2015 Fellowship Event. Players, November’s Fellowship Event is your first chance to play through the challenges of Murder at the Prancing Pony and your only chance to get your hands on the event’s exclusive playmat and alternate art Legolas!